Energy firm Npower has announced that electricity prices for its domestic customers will rise by 12.7%, while gas bills will see a 17.2% increase. Npower, the UK's fourth-largest energy provider, said it had been "forced to put up prices" because of soaring wholesale energy costs. It said it expected rival energy providers to follow suit with their own price rises "very shortly". Npower's four million customers will pay the higher prices from 5 January. "Today's decision was not an easy one," said Giuseppe Di Vita, managing director of Npower's residential business. "We always try to protect our customers for as long as possible but sadly higher energy prices are a fact of life." 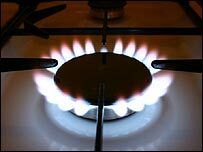 Npower said wholesale energy prices for 2008 had increased from last year by 66% for electricity, and 60% for gas. However, its price rises have already been condemned by independent consumer watchdog Energywatch. "If this is the shape of things to come over the next few months, we are going to see hundreds of thousands of consumers wonder how they can afford to keep their homes warm," said Energywatch spokesman Karl Brookes. "Energywatch calls on other suppliers to respond to current high wholesale prices by competing over the long term with good value products, and not to simply load the risk of wholesale prices on their own customers." Price comparison website uSwitch said it had only been a matter of time before one of the energy suppliers put up its prices. "By announcing price increases today, Npower has given the other suppliers the green flag they've been waiting for," said uSwitch's head of home services, Tim Wolfenden. Npower had already increased its online tariff for new customers, raising that by 17% towards the end of last month. In December, British Gas parent Centrica announced that it was increasing the price of its market tracker tariff, which follows movements in energy market prices. British Gas went on to warn that rising wholesale prices meant the energy industry was facing a "difficult environment" in 2008. Charities have warned that some of society's most vulnerable members may be forced to choose between food and heating as fuel bills rise. Fuel poverty charity National Energy Action (NEA) said that the price rises would be "deeply worrying news" for households on low incomes. "For many people, particularly the vulnerable, price hikes mean very real decisions between choosing to heat their home or doing without other essentials," NEA chief executive Jenny Saunders said. "Rising fuel bills are bad news for a lot of older people," he warned. A spokeswoman for the Citizens' Advice Bureau urged people who were struggling with their energy bills to find out about and claim the extra help and free services that were available. These included access to grants and benefits and advice on how to stay warm this winter, she said. Analysts say wholesale gas prices have risen on the back of the record cost of oil, as any increase in the price of crude has a knock-on effect on gas. Wholesale gas prices in the UK are also said to have been driven higher by the growing number of energy firms on the continent turning to the more liberalised UK market for cheaper supplies. The higher cost of gas means increased electricity bills because gas accounts for 40% of electricity production in the UK. UK household energy bills last rose strongly in 2006, with most suppliers increasing their bills to counter higher wholesale prices. However, prices then subsequently fell back during last year. Npower is the supply business of UK-based RWE Npower, itself a subsidiary of German energy group RWE. RWE Npower also operates a number coal, natural gas, oil-fired and renewable energy power stations across the UK. Its most recent full-year financial results show that RWE Npower made an operating profit of 512m euros (£383m) in 2006.